Here are my authentic replica magatama all stacked together. Any of them are 1 to 1.75 inches long. They're guaranteed to be handcrafted by myself, as accurate a replication as you can get, and much lighter than the actual stone originals! You can purchase them for free delivery in the U.S. by clicking a product number (email ordering system, allow 2 - 4 weeks) or use the immediate purchase paypal button when available for expedited service. 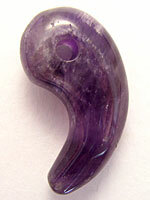 Shiny dark color replicates original hematite stone. 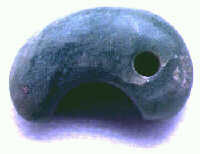 mottled green color replicates original jadeite stone, that shown buried during the Kofun period, 250 to 538 C.E. Don't know how to decide, or got them all already? 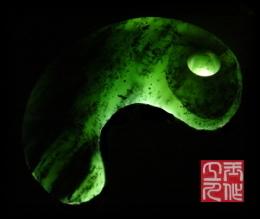 My custom magatama looks similar to historical magatama under regular light but contains phosphorescent glow-in-the-dark materials for an unequaled look under black light or when immersed in the dark. One-of-a-kind, hand crafted by myself, so you know it will be good. Thanks for your interest!